The media increasingly covers news about ‘digital health’ or ‘health tech’, and there has been a drive for the NHS to increase its uptake of technology. NHS England has set targets for paperless patient records by 2020, and one of the key messages in a 2016 report from The King’s Fund was that ‘digital technology has the potential to transform the way patients engage with services, improve the efficiency of care, and support people to manage their health and well-being’. Harnessing technology and innovation also features strongly in the government’s Next Steps on the Five Year Forward View, published in March 2017, while the RCN is promoting the effective use of digital technologies with its Every nurse an e-nurse campaign. The aim is to get nurses and midwives involved in the design and implementation of technology, as well as using data to improve patient care. The overall message is upbeat, but just like the general public, front-line staff have mixed abilities when it comes to technology, and vary from technophobes to those always updating to the latest gadget. Many of us have embraced devices such as smartphones and fitness trackers in our personal lives, and routinely use Google to find answers to a multitude of questions. At work, however, we can find there is still a heavy reliance on paper. Nurses use WhatsApp groups and comment about nursing and healthcare on Twitter, but more often than not they are using paper observation charts and documentation in the workplace, keeping daily handover sheets covered in scribbled notes in their pockets. This can be due in part to lack of confidence in technology, its reliability and ease of use, as well as a concern that technology will take them away from the bedside. An increasing number of hospitals are adopting electronic observation tools that automatically calculate National Early Warning scores (NEWS) and have built-in escalation plans. Research shows that this can produce impressive improvements in patient care, with reduced admissions to critical care and quicker responses to deteriorating patients. Some of the systems, such as Nervecentre and PatientTrak, have sepsis alerts and links to care bundles, and can also be used as an electronic handover tool. Entering data electronically has the benefit of making it visible throughout the organisation, so staff who are in meetings or clinics can see when a patient needs urgent attention. Care can be documented in an electronic health record/electronic patient record (EHR/EPR), with some organisations using electronic prescribing and medication administration systems (ePMA) too. Both have the advantage of being legible and accessible from many places. Prescriptions can also be changed, dispensed and administered in a more timely way, without the need for staff to continually try to contact a doctor who is in clinic or busy with admissions. A range of staff can be alerted if a patient deteriorates, and the NEWS score or sepsis alert appears on the device they have with them wherever they are in the hospital. Over the next ten years the world of health technology is likely to develop at an even greater pace. If NHS England’s vision is realised, every practitioner across the country will be working with electronic health records. While community and mental health settings tend to have more coordinated electronic care, this does not necessarily translate into better exchange of information with systems in acute settings. A hospital may not be able to see a report from a mental health nurse, for example, or a GP may not be able to request tests at the local hospital. The NHS e-Referral Service, which allows patients to book hospital or clinic apppointments online following referral, is helping with this but is not available for all services. Technology can also affect how we interact with patients. An increase in the use of patient portals or Skype consultations allows patients to take more control of their care, for example by taking their own blood sugar readings and passing on the results to staff who check them from afar. Through technology, patients can also provide feedback on services that can be viewed in real time and create their own support groups on social media sites, such as Facebook or WhatsApp. Remote monitoring: measuring blood pressure at home gives the patient greater freedom. Advances are being made in ‘wireless wearables’ that allow patients to be continuously monitored in their homes and in hospitals in a much less invasive way. These systems capture large amounts of data and have the potential to analyse and predict care in ways that have not been possible previously. DeepMind, an artificial intelligence company owned by Google, hit the headlines in 2016 when it partnered the Royal Free London NHS Foundation Trust to develop an app aimed at improving the identification and treatment of patients at risk of acute kidney injury. Such information also provides a rich source of data for audits and initiatives to improve services. With the range of technology available for use in healthcare expanding rapidly, it is important to remember that not every development is suitable for every workplace. Devices and systems can only assist us if they are fit for purpose. Staff also need adequate training in how to use them, while organisations must ensure they are integrated properly with other systems and have reliable connectivity. An independent report commissioned by the government recommends that IT systems be designed with the input of users, and recognises that poorly designed and implemented systems create opportunities for error, and can result in frustration for healthcare professionals and patients. As NHS Digital programme director Cleveland Henry told last year's UK e-health week conference in London, we need to ensure that technology is making things easier than doing the same job without it. Of course, any new technology also costs money. But by adopting ‘invest to save’ principles, the initial cost of technology that helps treat deteriorating patients more quickly or helps manage clinics more effectively can be recouped through reduced length of stay and better use of staff time. Research has shown a decrease in mortality with the introduction of electronic observation systems, and Skype consultations can cut costs and infection risks for immunosuppressed patients. 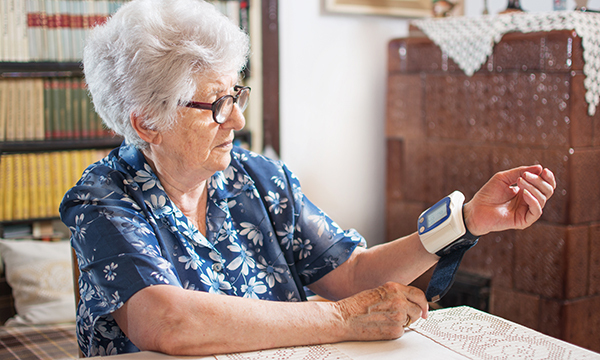 Replacing equipment requires forward thinking, but if a wearable device is going to capture observations more comfortably and effectively than traditional blood pressure machines, it is an investment in better care. The WannaCry worldwide ransomware attack on IT systems in 2017, where hackers encrypted data and demanded a ransom for its return, caused more panic than harm, but it showed the potentially crippling effect hackers could have on the NHS. It is vital that healthcare staff are mindful of the risks as well as the opportunities with technology and follow simple rules, such as never opening attachments from unknown email addresses. WhatsApp is a great way of communicating with others but it should not be used to share clinical information. More secure alternatives, such as Siilo, are available for healthcare organisations. There are also rules about information governance and how data can be shared; the new European General Data Protection Regulation (GDPR), which takes effect on 25 May, introduces new standards for processing and storing personal data. This will provide more protection to individuals, and require organisations to be more explicit about how users’ information is used. We also need to speak up for our less technologically able patients. Sending appointment details to patients via text message or email rather than in the post may reduce costs, but some patients do not have a mobile phone or access to a computer, while others will prefer to receive a letter with the clinic details when they are referred. As part of its Widening Digital Participation programme, NHS Digital has produced an inclusion guide to help those who lack the confidence and skills to access and use digital health services. Nurses can improve uptake of technology in healthcare settings by talking to colleagues in other trusts or sectors, sharing information about technology, and looking out for ways technology can improve patient care or service provision. Could you Skype a colleague to ask advice rather than writing an email or scanning a document? Could you make use of e-learning or webinars for teaching sessions? Those on Twitter can share ideas with the nursing community through groups like @WeNurses and see the 6Cs in action at @6CsLive. Technology has the potential to enhance communication and interactions with patients and improve patient safety. By getting involved nurses can help ensure the right systems are introduced in the right way.